One of our favourite events of the year! 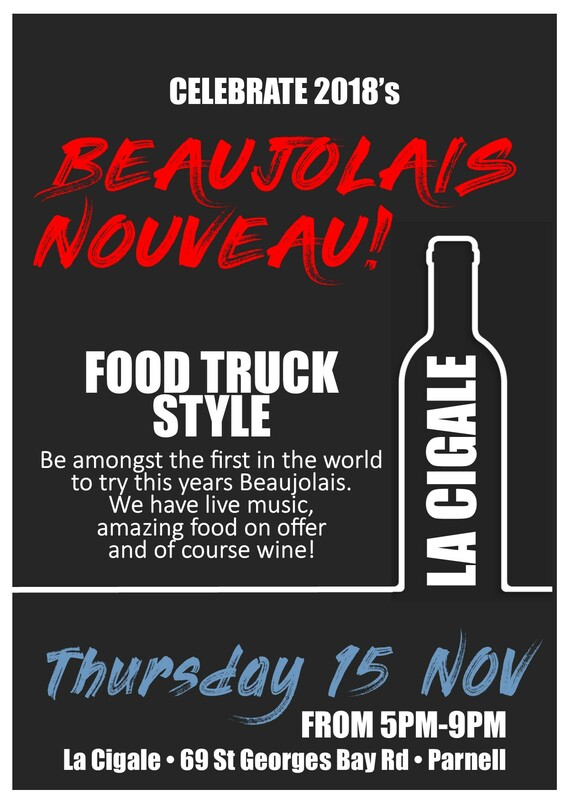 La Cigale invites you to be a part of the worldwide celebration for the release of Beaujolais Nouveau 2018 on Thursday 15th November. Instead of our usual set menu offer, this year we are celebrating in a more casual style with a host of Food Trucks, Live Music and mostly importantly WINE! In keeping with tradition the new season’s harvest is released at 12.01am on the 3rd Thursday each November with music, festivals and fireworks. In New Zealand we are lucky to be amongst the first in the world to drink this young, fresh, light and fruity wine. The gamay grapes from which Beaujolais is made were only hand picked about 6 weeks ago in the Beaujolais Region of Southern Burgundy! In conjunction with Auckland Food Truck Collective, La Cigale invites you to a night of an amazing lineup of European food trucks, entertainment and wine. La Cigale will be running a full bar plus a special select French food menu of Escargot, Raclette and French cheese platters.